On Wednesday, October 4th, I was one of a number of people who joined a special immersive “voyage” through ancient Egypt, visiting three sites of antiquity which are not open to the public in the physical world, but which have been digitally re-produced in a virtual environment for the purposes of study, and have also been optimised for presentation in Sansar. Joining us for the journey were Kevin Cain, Director of INSIGHT – the Institute for Study and Implementation of Graphical Heritage Techniques (also sometimes called Insight Digital) and Dr. Philippe Martinez, INSIGHT co-founder and Lead Archaeologist, author, and University of Sorbonne professor. INSIGHT, in collaboration with the Egyptian Ministry of Antiquities, has been at the forefront of digitally capturing sites of antiquity in Egypt, and Dr. Martinez himself was one of the earliest exponents of computers and 3D capabilities in archaeology. In the 1980s, for example, he encoded the decoration of 12000 blocks dating to the time of Amenhotep IV – Akhenaten, discovered reused in the 9th pylon at Karnak. The database was then used under artificial intelligence techniques with the output of hundreds of virtual reconstructions belonging to the first temple dedicated to the god Aten. Also around that time, he spent two years working on a 3D reconstruction of the ancient Egyptian temples of Karnak and Luxor. INSIGHT’s work now involves state-of-the-art techniques such as LiDAR (Light Detection and Ranging), a surveying method that measures distance to a target by illuminating it with a pulsed laser light and measuring the reflected pulses, and photogrammetry, the science of making measurements from photographs. 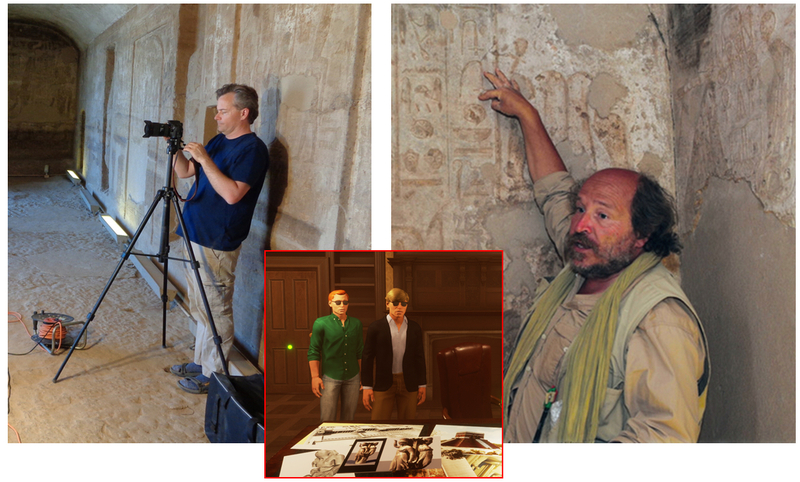 INSIGHT’s work in recreating sites of anitiquity in 3D was also intriguing revealed during some of the earliest looks inside Sansar prior to the Creator Preview opening, when images of the tomb of Nakhtamon (“TT341”) were used in various promotional talks and demonstrations of the platform (see here for an example). The tomb of Nakhtamon is one of three locations thus far reproduced in Sansar in a collaboration spanning INSIGHT, the Sansar Studios team, the University of Sorbonne and the Egyptian Ministry of Antiquities. Both it and the cenotaph at Gebel el-Silsila, were scheduled stops on the tour, but such was the interest shown in the tour and in INSIGHT’s work, the tour was extended to include a reconstruction a section of the Ramesseum “Coronation Wall”. For the purposes of the event, the two primary destinations together with the Voyage Live: Egypt experience, where people initially gathered, were spun-up in their own special instances. This meant that casual visitors to either Voyages Live: Egypt or the locations on the tour would not feel that they were intruding on a private event or have their own visit spoiled by a group of avatars suddenly crowding them out and getting in the way. This in itself demonstrated a key strength of Sansar: the ability to spin-up instances of experiences to deal with special events and the like, without necessarily having to close them off from public access / other uses occurring at the same time. The Ramesseum “Coronation Wall” reproduced as a 2 million poly model in Sansar, optimised from an 800 million poly original. At Voyages Live: Egypt, attendees were introduced to Kevin Cain and Philippe Martinez, and a little time was spent talking about INSIGHT’s work, the backgrounds of our guides (Mr. Cain, a specialist in computer graphics and imaging worked widely in the film industry before a fascination with preserving sites of antiquity drove him to establish INSIGHT as a non-profit entity specialising in the digital recording and mapping of sites of antiquity, as which has now worked in a dozen countries around the globe). INSIGHT’s work is not only fascinating from a lay perspective – offering the potential for VR and a platform like Sansar to open-up historical sites for education and learning across all ages without putting the actual site at risk – but because it is of very real benefit in helping to preserve ancient sites from accidental damage, whilst providing archaeological teams an opportunity to effectively study locations even when the locations themselves are not open to study, again to help preserve them. As Dr. Martinez noted during the tour, much within these sites is delicate. Take the paintings in the chapel room of Nakhtamon’s tomb, seen in some of the images here. These are so incredibly fragile (a result of the pgments use and their extreme age), just accidentally brushing them with a hand or item of clothing can cause them severe damage and loss. Thus, detailed mapping and 3D reconstruction, together with the data gathered through the use of LiDAR, photogrammetry and other techniques allow experts to study them in as much detail as would be achieved by standing in the tomb itself. To achieve this, the INSIGHT models are of incredible complexity. The tomb of Nakhtamon, for example, started as a 50 million polygon model, while the section of the “Coronation Wall” at the Ramesseum was originally reproduced for the purposes of detailed study in an 800 million poly model. In their original form, neither could be easily made available through a platform like Sansar, so both have been optimised as models of some 40,000 and two million polygons respectively. While this does led to some loss of fidelity and detail, both are still nevertheless remarkably detailed and compelling. Obviously, what particularly brought the tour to life was the knowledge of our two guides and their willingness to answer questions. Through them, the period of the Middle Kingdom was laid open to us – customs, beliefs, the importance of the Nile in culture, physically, religiously and mythologically, the curiosities endemic in studying ancient Egypt and understanding customs and outlooks on life and death, change wrought by evolving capabilities and belief systems. We also gained further insight into how modern technologies are helping archaeology to evolve. I’ve long been convinced of the potential of Sansar in finding a niche in academic study and in education, and the Voyages Live tour demonstrated this in spades. For the 90+ minutes of the tour, we were all – whether or not we were in VR (most actually weren’t) – fully immersed in the sites from ancient Egypt, the very personable commentary from our hosts bringing the scenes fully to life. One thing I do hope that comes out of this is that these locations – the cenotaph, tomb and wall section – are further enhanced, be it with interactive elements providing historical / cultural context or via audio commentary or a mix of both so that others can feel so richly immersed and informed as those of us attending the tour. The Lab has also indicated further tours of a similar nature are also being planned. I’m not certain if these are to other locations the Sansar might be developing with other partners, or further tours through these specific sites. However, if the latter, I really cannot urge anyone who didn’t make the first event to sign-up and participate, when further tours are announced. And if tours to other environments within Sansar are offered, it’s more than likely I’ll be one of the first in line to hop on! Many thanks to Dr. Martinez and Mr. Cain, and the folks at the Lab who all had a hand in making the tour possible, and in bringing such unique content to Sansar and sharing it. The reign of ‘the’Heretic King’ has long held a fascination for me… so I was proper miffed at having to miss the event due to a prior engagement. I can’t wait to find out where future such tours may take us. We were exploring a little after his time – era of Ramses II, but I think you’ll find the experiences an worthwhile visit 🙂 .